Pain under your shoulder blade (scapula) can be related to something going on with supporting structures in this area or to something happening in your upper back. 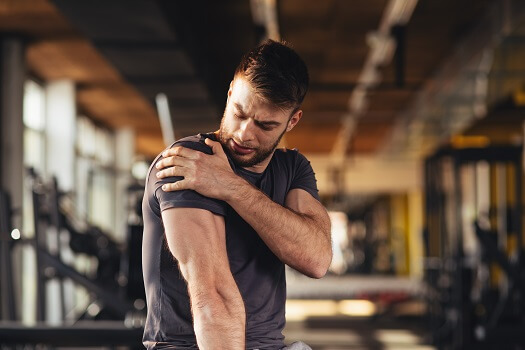 Even if this type of pain is fairly localized within your shoulder area, it can still be distracting enough to affect the ability to go about your daily routine. Increase your odds of responding well to treatment efforts by taking a moment to learn more about some of the possible causes of pain under the shoulder blade. Habitually slouching or leaning forward as you sit can progressively change your spine and the structures around or below your shoulder blade. It’s often seemingly little things—such as tilting your head down to use your various devices or leaning to one side as you type at work or read a good book—that can weaken certain muscle groups or create an imbalance that extends to your shoulder blades. Practicing softball for the first time after a long winter break from sports or reaching up for long periods to paint a ceiling, take down holiday lights, or clean gutters are just some of the ways you can overuse your shoulder/upper back muscles or ligaments. Soft tissue overuse can also contribute to strains or sprains and related inflammation and pain. Fibromyalgia is a chronic disorder that amplifies pain sensations throughout the body. The widespread pain and tenderness associated with this condition sometimes extends to the upper back and around the shoulder blades. The resulting discomfort, which is sometimes intermittent, can range from dull aches to sharp, shooting pain. Often caused by underlying conditions such as osteoporosis, a compression fracture is a tiny crack in a vertebral bone. If this type of fracture occurs in your upper back area, you may feel discomfort that extends to the area under your shoulder blade. Discomfort is often triggered by movement, which means you may feel better when at rest and notice an uptick in pain when you become active. Treatment may involve surgical intervention such as a kyphoplasty procedure. Santa Monica patients should see a spine specialist for proper diagnosis and treatment. When a disc becomes herniated, inner disc material pushes outward through the disc’s tougher exterior shell. Painful symptoms, which may include a combination of localized and radiating discomfort, can occur if nearby nerve roots are irritated. It’s more common to experience herniated discs in the lower back or neck, which is why you may not immediately associate pain under your shoulder blade with a damaged disc in your thoracic (upper spine) area. Treatment for pain under the shoulder blade depends on the source and extent of the damage to affected tissues or structures. If it’s an overuse injury, treatment would likely include therapeutic exercises and medication to ease inflammation. Pain in this area isn’t always avoidable, but you can reduce your risk of experiencing this type of discomfort by paying attention to your diet, exercise, and posture habits along with your form and technique when playing sports or lifting things. If you’re experiencing severe or persistent pain under your shoulder blade or in any other part of your back or neck, see a Santa Monica spine surgeon as soon as possible for diagnosis and treatment. The industry-leading physicians at The Spine Institute are pioneering spinal health experts with years of experience treating every kind of back and neck pain. Call one of our friendly representatives today at 310-828-7757 to schedule a consultation.